during the previous year, award to be decided by the Steering group. 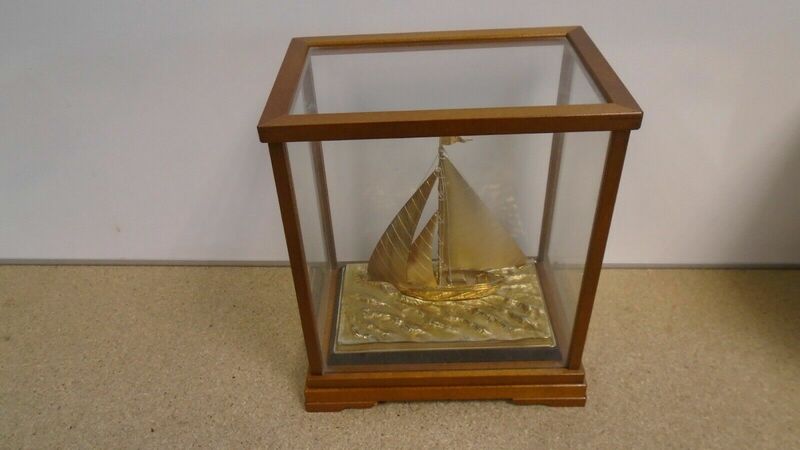 and can get their name engraved on a brass plate to be affixed to the base. They will also get a small plaque to keep. Click on the logo, picture or text to go to read the log. Dougaljo Sails to the Med! Click above to go there. This is a trip made a few years ago now but never before seen on paper. The log was written up at the time and typed out, but had to be scanned and converted to a modern format so it could be read. We are awaiting the pictures to add these. Click here to go to her log. Click this logo to read the log of Fiddler's Green travels in 2013. You can view the five short video films I made by clicking here. And read the remaining part of my round trip by clicking here! Not in one of our designs, but worthy of a place on the pages! to my home port of Connah's quay. I made a little video of the trip if you would like to share the link? and your site is wonderful to look through. Sailing the African coast in an Eventide 24! A series of mini cruises and day sails around the Solent area! Log of the Barbican Chime, round the UK coast. from Suffolk to Dorset. 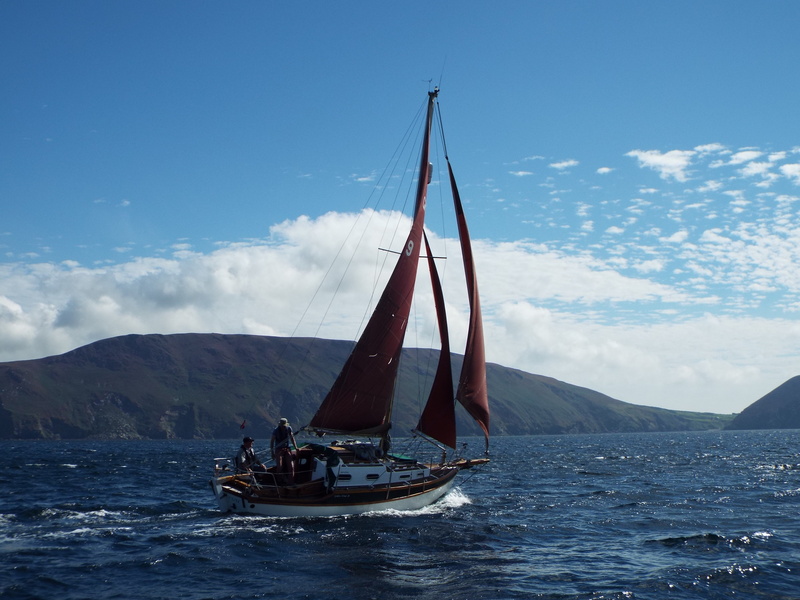 First sail of 'Iris of Glenarm' - Killeagh - Port St Marys and back 2016. After buying Iris and signing papers on August 1st, and Iris lying for 2 years, I made a mission to get a cruise this season.... August Bank holiday was the obvious choice. I couldn't take time off work, so every evening (and weekends) I prepared to launch. After much WD40, fresh oil, fuel, water purification tabs, elbow grease and a bit of help from other club members, I found myself waiting for the tide at 4AM on August 24th. I had hoped to launch earlier, but some jobs (and crane operators!) are not to be rushed. 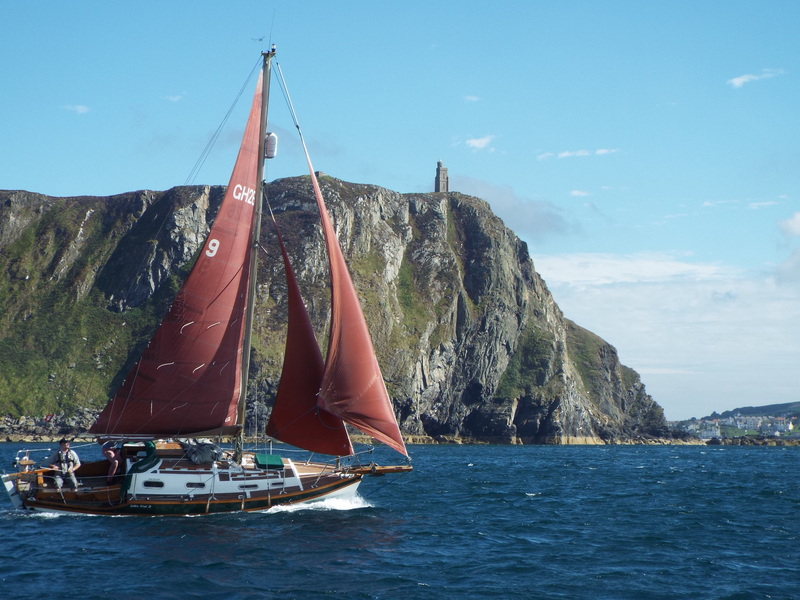 For the first trip on Iris, A friend agreed to go to the Isle of Man (7 hours from our base) on the Thursday night. OK Thursday didn't happen, as we threw a fan belt on test.... Friday morning tide let us through the narrows of Strangford Lough. 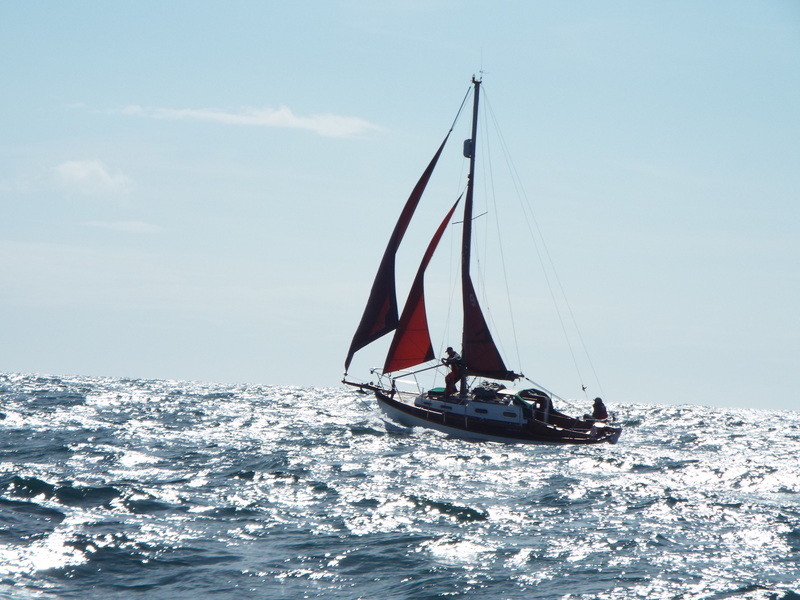 The boat handled well (bit more weather than I am used to - might need to 'fix' that)... through the Narrows, with tide, we clocked 12 Knots over ground, Jib and staysail up with the motor, over the bar. Fired up the engine, and made it into Peel in time for the flap gate in the marina. Day 2 was fair 3-4 for Port Erin (lunch). Round the Calf in adverse tide, to berth in Port St Mary. Unfortunately, the engine water pump shed its old impeller - had a spare, but the damage was caused by the semi Lunar part of the pump failing its fixture. A massive thanks to the Port St Mary Harbour Master and the members of the sailing club, who helped source drills , self tappers and Araldite to affect a repair on a Sunday. Spent the rest of the day testing the fixes. Unfortunately, we were against the wall there, and discovered that a Golden Hind 26 spreaders are wider than the boat! No damage to us against the wall, but our friend with his Kings Class 9 Metre decided to get his shrouds intimate with mine - mine won! No more sailing (for him) - so we decided we had to head back. 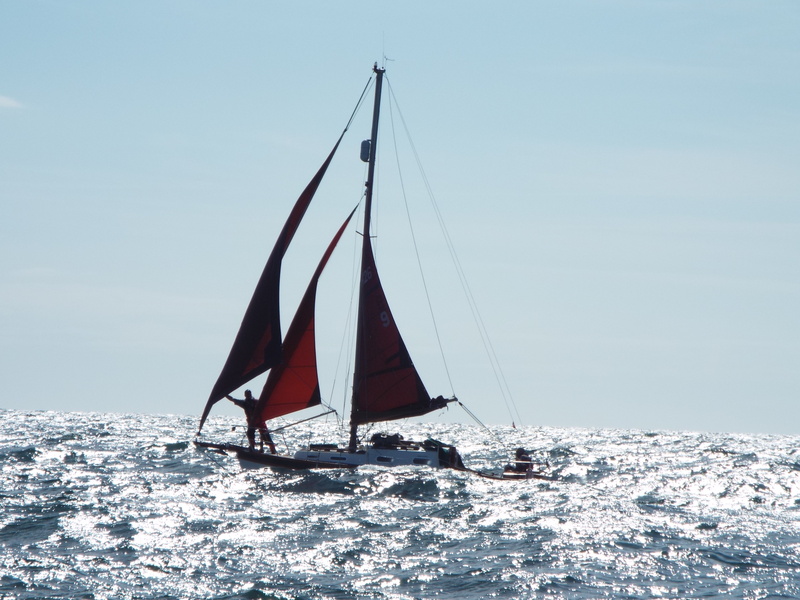 Forced to motor for about 3 hours due to tide and wind - gentle sail back to the bar mouth. Got there a bit early - the tide was still out flowing - had to hove to for an hour until we could get in - average less than 2 knots for the first hour - sail and engine. Hugged the shore later (love the 3 ft draft), and were literally a biscuit toss from the beach. An hour in, the tide died, and we were able to proceed at around 4kts. 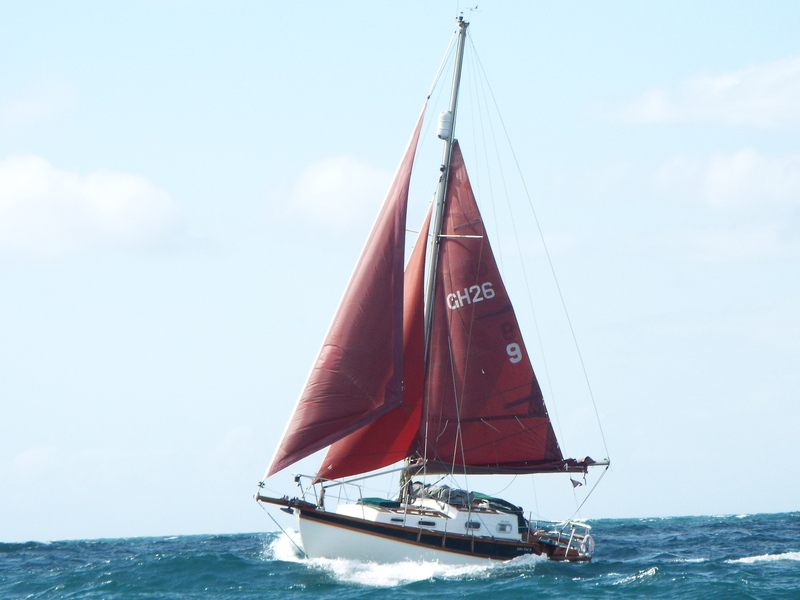 This was her first sail in 2 years - apart from a few mechanical issues, I felt the following: the yankee seems a bit small in less than force 4 - has anyone put a larger one on- if so are there any sail plans? I was thinking of a foam luff one which might hold its shape better reefing as the breeze picks up. There felt to be a vibration in the tiller at 4 knots - I noticed some have modified their rudders - I think I would build one, if I can find a plan- anyone done one on a 26? The boat could also do with some form of tiller extension the- I might build a nice hard-wood one to bring sitting under the sail hood possible in showers. The finish is beautiful (Tony Erskine, number 9) and the ride feels so safe under sail. BTW, she is missing her ships table - would anyone know of a design or have a scrap one to take pictures off? please find pictures - any advice on rigging would be appreciated! Looks as though John could benefit from a larger genoa as he thought and another row of reefs in that main, that will lessen the weatherhelm. As for rudders, MG did us a drawing and that is reproduced on the hints and tips page. If you cannot find it on this link, contact us direct and I will mail it as an attachment, works for me on fiddler's Green. 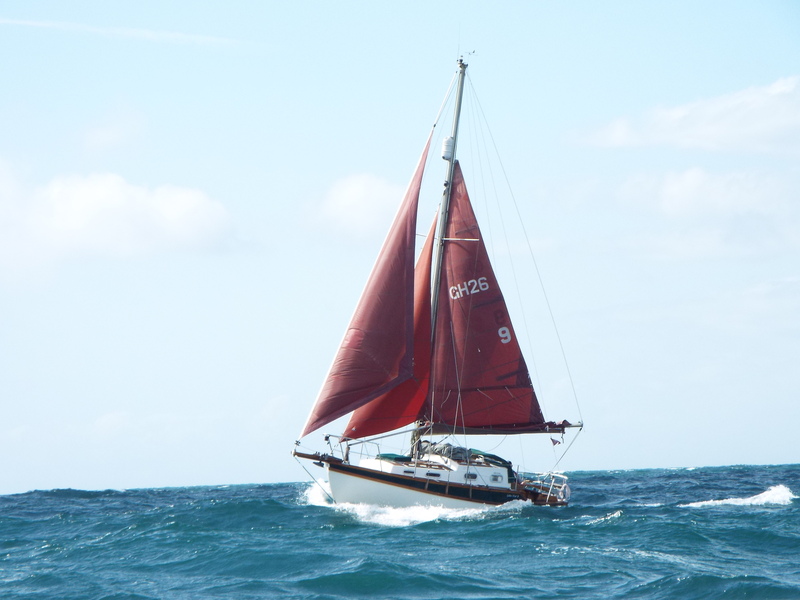 I get an odd vibration at 5 knots, its the bilge keels thrumming! nice to hear you know she is sailing well! fades as speed increases! Copyright © 2001 [Eventide Owners Group]. All rights reserved.